Almost any cell phone can get you rescued. But a smart phone gives you more ways to reach help. When cell phones were first introduced, a key selling point for families was the help they could provide in an emergency situation. Even the limited functionality of the early phones allowed you to reach emergency services. Prepare yourself for the unexpected. Here are eight tips for helping yourself or loved ones following an accident or other emergency situation. Verizon, Sprint and AT&T all have locators to let you find missing members of your family. If you are lying unconscious somewhere, this could help speed them to you. 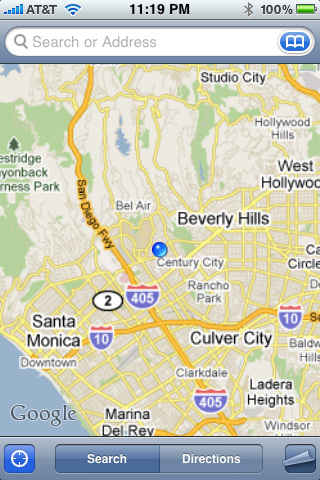 Most smart phones have GPS functions now. If you are conscious, this could help you give your location to rescue workers. If you have a smart phone, there are apps* that put ICE information on the home screen of your phone so it’s easy to find. 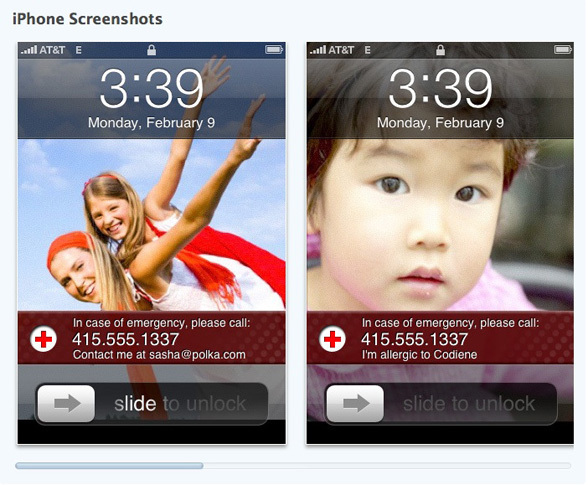 There is one for iPhone called Close Call, which will work even if your phone is locked. Here is how this app works. It helps you to create a wallpaper shot using your camera roll. You could actually do this yourself by creating an image with your emergency information without using an app but the app makes it easier. When you set an image on your iPhone cameraroll as wallpaper, it is visible even when your phone is locked so – voila. This Close Call link is to the iTunes app store for iPhone apps so if you don’t have an iPhone this will not work for you. If you are looking at Close Call, you can also consider other apps in this genre – paid and free – but do check the reviews included on each app page in the store. Jared has an ICE app for the BlackBerry. Close Call and Jared are free apps. Appventive for the Android based smart phones also looks worth checking out. 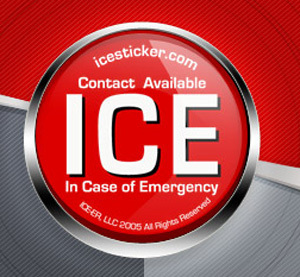 Get an ICE sticker for your cell phone at IceSticker.com – which advises us that 1,600,000 emergency room patients could not provide contact information during just one year, 2006, because they were incapacitated. This will give you easy reference during an emergency. “App” is defined at the end of this article. Text someone who can do something to help you. To be prepared to text easily, keep your address book up to date so that you just need to type the beginning of someone’s name. Again when you have limited phone reception, texting may work. I recommend that you have texting enabled on your phone even you don’t plan to use it regularly. Sometimes people respond more readily to a text than a phone call. Like much of the advice here, this is something you do NOW, you don’t want to be searching for apps* after an accident. Thank you to CNN for running a story on this topic. App: Used to refer to smart phone applications which are downloaded free or for a small fee. If you own a smart phone you should take advantage of these. 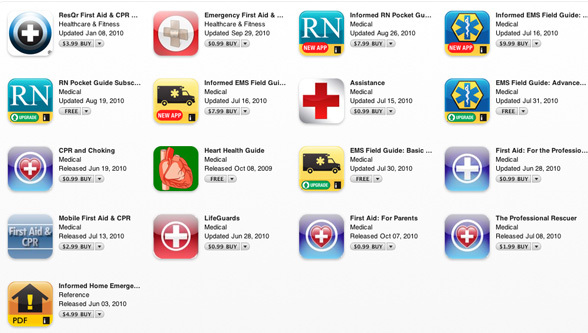 iPhone apps are found in the app store on iTunes. Screenshot: You can take a picture of your computer screen or parts of it. On the Mac there is built in program called “Grab” that lets you easily create images that can be emailed as an attachment to someone you are trying to explain what is going on on your computer. On the iPhone, you can create a screenshot of anything on your iPhone screen by holding down the middle lower button, and clicking the top right power key. I will create an article about this for you. 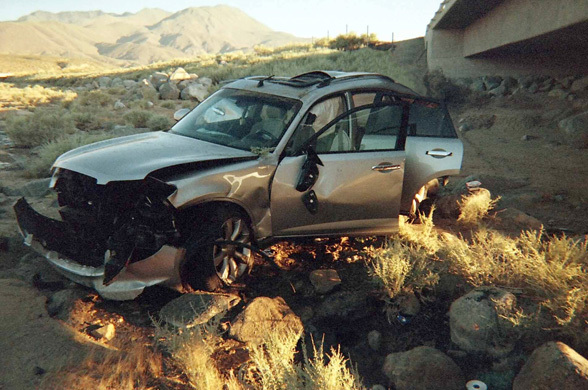 Further on the car photo above: My partner, Bruce Sallan, wrote about his experience in an article on gratitude. My other partner, Ray Gordon, also used a cell phone in a serious emergency earlier this year. Both Bruce and Ray are very happy to be alive. Please be safe and be prepared!